In India, matrimony is not only between the 'two-consenting-adults' in fact it is between both families. Though in western culture such ideologies are considered quite controversial but back home they really are not. We all are quite at peace with our rituals. Few of those who aren't [people born in conservative families but happen to fall in love!] only need the courage and determination to fight the society [Read: Their family!] and when they do ... the society eventually accepts them! It's not all that big-a-deal! Anyhooo, I really do not want my 'Special-Week' to be a history lesson on Indian Weddings. I will just walk you all through what I wore for what occasion and why. Cool? The red-mark on my husband's forehead is a symbol of blessing. I had it too but had to remove it for the pictures, as it had gotten a little smudged. So the first ceremony was - Roka [loosely translated as an Agreement]. This is when the two families formally accept the relationship and hence make it public. Only close family and friends are part of this ceremony. The bride-to-be is given gifts by her in-laws-to-be as a token of acceptance and welcome. The couple are given blessings by everyone present. Disclaimer: I have this OCD to always be/look different, yet comfortable! The outfit [otherwise known as Salwar Kameez] is from a local designer. I was aware that the ceremony would include people dressing me up [with jewelry, bangles, nail paint, etc.] and I would have to bend to touch my elders feet [we touch our elders feet to seek their blessings!] therefore I wanted to be in something comfortable and easy to move around with, yet - dressy! This fit the bill perfectly and I thought the belt was an interesting touch. P.S. For a change [:P] I am open to questions, if anyone has any. Also, India has many religions, castes, sub-castes etc. therefore the ceremonies/rituals are different from one family to another. Love this post! It's so neat to hear about different customs and traditions! PS - You looked gorgeous! Hey!i went back with this memory.It feels as if it was a couple of months back. Love your outfit.Both of u are color coordinated Sweeet-Hearts. This is amazing! I can't wait to see the rest of the pictures you post this week. You look absolutely beautiful. Also, I'm supposed to be getting married this year (although my parents aren't completely on board :P) and he and I are from completely different 'traditions' (although both Indian) which is causing some problems for our wedding ceremony. If you ask me I would just like to sign a piece of paper and be married, because I am excited about the marriage, not the wedding... ah well. We'll see what happens! you have rightly said, for us indians, its not only about two consenting adulta , but two families also...even in love marriages, when two families are in agreement and harmony, married life is smooth and full of love!! 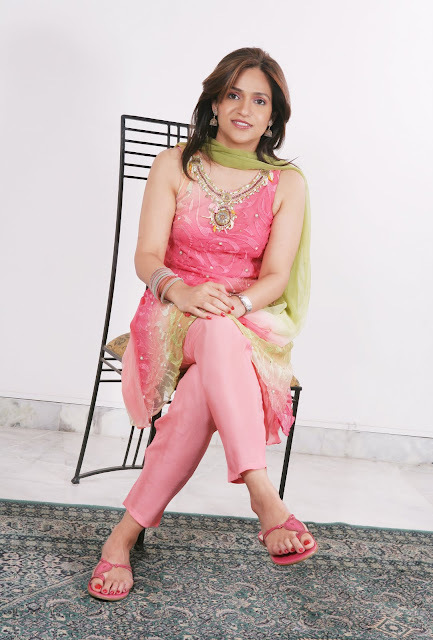 liked your roka pics, pink peachy salwar is a cutie!!.. Pink is definitely your color lady! Don't you just love how diverse India is. South Indian weddings are so different..
Awwwwwwwww both you and Ashish look soo exotic! Paisley on your shoe huh? :) And your watch is fab too. You both make a fab couple. awww wow you guys look super can't wait to see the rest of the album. strangely enough i feel you guys look younger after three years of being married. maybe love does that to you. i really wish you all the luck and love tanvi for your future. Great post! I enjoyed learning more about your culture! beautiful! happy-lucky couple... like your ps at the end of the post. but yea, thanks for sharing! Terrific pictures - they are worth a thousand words and lots more. You looked absolutely beautiful! The make-up is perfect, it enhances your features without overpowering them, and your hair looks gorgeous too! So much volume and body, and I love the highlights! The oufit is wonderful as well, the colour looks great on you, and I think it's fantastic that you really took the practicality of it into account! Aaawww! U both look so good! Three years ago! Time flies! Gorgeous colors. I actually appreciate the cultural lesson. I am a big fan of this week blogging!!! Tell us EVERYTHING!!! All the fun memories came back. You look wah-wah! And you are wearing my favorite watch! finally, your set in the 'after' pics... droolworthy! Hi Tanvi, I have been reading your style blog for a year or so? (maybe longer) and now I am preparing for my inter-cultural wedding in a year and i saw Wedding as one of the labels and started browsing. anywho, really enjoyed your wedding posts in pictures!